Anyone who knows me will tell you that I fully embrace the old saying, “A bad day fishing is better than a good day at the office.” My addiction to fishing started with my father, who was an avid angler. He handed me an old tackle box, a small fishing rod tipped with a hook and bobber, and a plastic cup full of worms. Then he taught me how to tie on a hook, rig the bobber, and weave a wriggly worm onto the hook. Eventually we moved on to coastal fishing, trying our hand at catching flounder off the beach and large striped bass in our home waters of the Chesapeake Bay. We did it all in our ugly green—but beloved—12-foot, Sears & Roebuck Ted Williams skiff. Looking back, there are perhaps no better memories I have than fishing with my dad. So, maybe you’re looking to create some of your own angling-oriented memories with your family, but don’t know how to get started. That’s something I hear often from non-angling friends with families: “Hey, Gary, I want my kids to have the kinds of memories you did with your dad; teach me how to fish.” While I can’t teach you how to fish in one short article, I can give you a shopping list for some gear I’ve used and recommended to others to get going. Visit your local tackle shop to find out more on the specifics about which hooks, rigs, or lures to use for the fish that inhabit the waters you’ll be angling in, and the techniques to fool them. If you’re completely new to fishing—perhaps you don’t know the difference between a bobber and a bloodworm—I’d recommend seeking out family or friends who can show you how to rig up and use some of the gear I’ll discuss. If you’re lucky, maybe you can even talk them into taking you out for a day on your boat or theirs to give you a primer in the basics. Otherwise, seek out local fishing clubs or conservation groups, which often have “Fishing 101” events to help introduce people to the sport, especially kids. With that in mind, let’s get ready to rumble. If a Jedi Knight is nothing without his light saber, the same is true for an angler and his or her fishing rod. One of the first things you’ll want to add to your angling arsenal is a fishing rod—one for each member of your family. 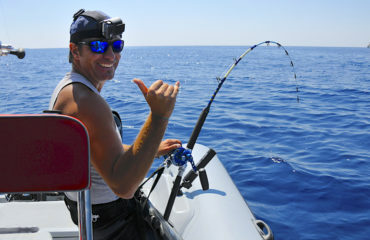 As a beginner, you can certainly break the bank and spend thousands of dollars on expensive, high-tech rods and reels. But you’d be wasting your money doing so, in my opinion. Instead, consider an inexpensive spinning rod/reel combo package. Some even come pre-spooled with fishing line, too. The thinking behind starting out inexpensively is that as you learn how to fish, you’ll likely hone in on a particular type of fishing you enjoy most. It’s at that point when investing in better rods that are built for the specific types of fishing you do makes more sense. 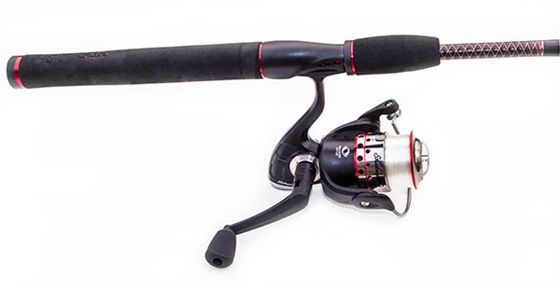 If you’re buying your first set of rods and reels for your family, consider buying a spinning combo, which includes the rod and reel. Also try to keep your first rod expenditure on the cheap side; you’ll eventually want to upgrade to rods that are specifically suited to different types of fishing. Photo courtesy of Shakespeare. 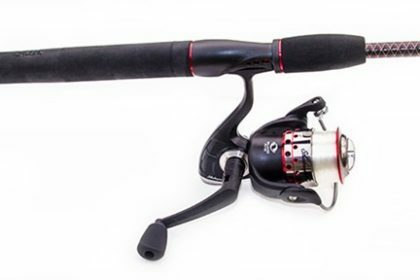 One particular combo I like for families is Shakespeare’s Ugly Stik GX2 Spinning Combo, which won’t trash your budget at only $50. These rods also can stand up to a tremendous amount of abuse, including being stepped on by careless little feet and tossed aside like yesterday’s worn-out toy. Bass Pro Shops, a large retailer with both brick-and-mortar shops and a huge online presence, also has a spinning combo I like a lot—its Power Plus Trophy Rod and Reel Spinning Combo. No matter where you shop, most tackle shops and outfitters have budget-minded combo packages available—ask for one they recommend. Whether you’re fishing primarily saltwater or fresh, look for a rod between six and seven feet that is classified as “medium action,” which refers to its stiffness. The stiffer the rod, the bigger the fish it can handle. For fishing line, 10- to 15-pound monofilament is a good all-around bet for starters, but you can go lighter if you fish only in small lakes and impoundments. If you have kids under about five or six years of age, there’s no shame in getting them a Barbie (or similar) rod. They’re cheap, effective, and there’s no great loss when they break. Again, if you’re just getting started, keep it all very simple… and cheap. 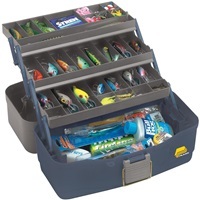 The Plano 5300 is a great beginner’s tackle box. Keep things simple and inexpensive when you start collecting fishing gear. Photo courtesy of Plano. All of that aforementioned “stuff” won’t do you much good rolling around in the bottom or bilge of your boat, so the next piece of gear I recommend is a tackle box. Again, start simple. The Plano 5300, for example, is a great beginner’s box, with three trays and a huge under-tray stowage area with a cost that won’t set your wallet on fire. No matter which tackle box you get, keep it small. Lots of anglers try to carry everything they own in one box, which means eventually they’re carrying around 50 pounds of gear, little of which they actually use. Instead of bringing aboard a tackle box full of different tools to rig up your fishing gear, consider a multi-tool, such as this Skeletool by Leatherman. It has a number of essential tools in a compact package that clips easily to a belt loop. Photo courtesy of Leatherman. Rigging up any sort of fishing apparatus usually involves one tool or another. As an angler, you’ll need something that can cut monofilament or braid line, a tool to crimp down split-shot sinkers, a knife to cut bait — and before you know it you need a tool box to hold your plethora of fishing tools. That’s why I consider the multi-tool a must-have piece of fishing gear. 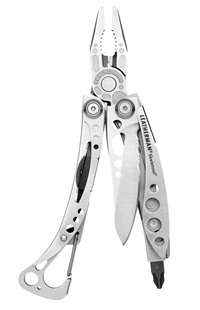 My favorite is the Leatherman Skeletool. It has the bare minimum of tools and a clever design that makes it lightweight and easy to snap right to a belt loop on your jeans without weighing you down. Onboard is a pair of pliers, a knife, wire/line cutters, and a neat screwdriver with both Phillips and slot inserts. While this is the one I like, there are all manner of different multi-tools out there at all sorts of different price points. Finding fish used to be left up to intuition and experience. You’d use your angling mojo to guess where the fish would be feeding—or hiding—and then you’d cast your bait or lures into an area that seemed promising. 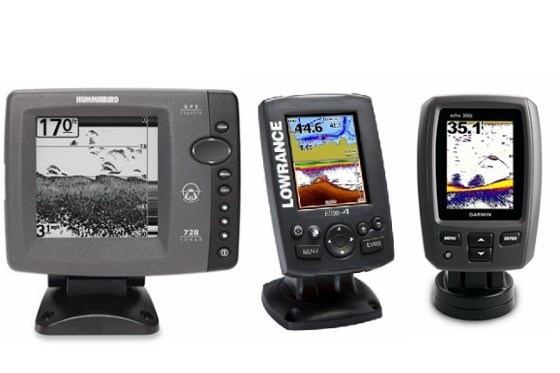 Today you can cut down on the guesswork significantly by buying a fishfinder. 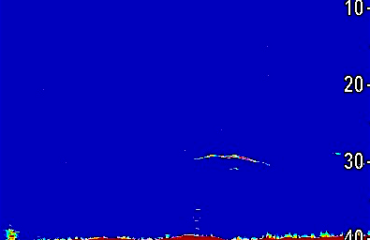 It’s a piece of electronics gear that sends a beam of energy down through the water column that, when it bounces back off the back of fish, displays the critters on an LCD screen, revealing their secret hidey-holes. Once you’ve found the fish, it’s simply a matter of casting to them and hoping they’re eager to feed. You might think that a fish finder is an expensive, unnecessary expense, but you can find many good units for under $300, and some even under $200. Your fishing success can improve dramatically by using one. There are all sort of fishfinders out there, but in keeping with the “getting started” and “budget” themes of this story, I hope you’ll consider a couple of good, but affordable, fishfinders before you break the bank on something big and fancy. You’ll be surprised how much more effective you are when you know where the fish are from the start. Getting them to bite is sometimes another story. Now I know you’re likely uber-excited to get out on the water and catch something, but not so fast. Unless you want to earn yourself a ticket—and possibly a hefty fine—make sure you secure the proper licensing required wherever you’ll be angling first. Some states allow folks to license the boat, which means everyone inside of it is covered, while other require a license for each person onboard. Some states even require specific licenses for certain species. Before you dip a line, spend some time online or visit your local department of natural resources or game commission to see what the rules and regulations are. Many tackle shops also issue fishing licenses—just ask. Fishing without a proper fishing license is a great way to ruin your day, so be sure to find out what you need to procure from the state/area you’ll be fishing in before you get started. 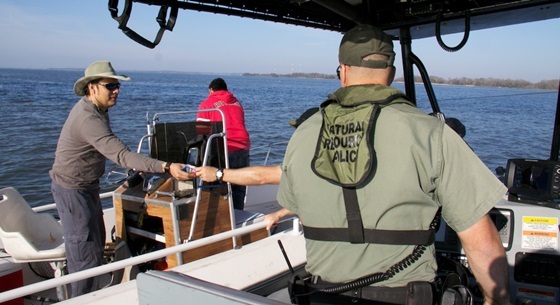 Here a Maryland Natural Resources Police officer checks an angler’s fishing license. Photo by Gary Reich. When you get your license, you’ll likely also be given a handbook that outlines the seasons, sizes, and creel limits (how many you can keep) for each species. Pro tip: Ask the person who issues your license if they also have a state fish ruler. Many states give out plastic or stick-on rulers that show the minimum sizes for the species that swim in their waters. Make sure you know the rules and have all the proper licensing before you go out. Not fitting within a specific category, there are lots of miscellaneous items that will help make your angling expeditions a success, and your crew a bit more comfortable. For gear, make sure you have plenty of spare monofilament, fluorocarbon, or braided fishing line, as well as extra hooks, bobbers, bottom rigs, swivels, jigheads, lures, bait, etc. Anything on the end of your line can be gone in a second if it meets with the right toothy fish or jagged underwater rock, so you’ll want to be able to have the right ingredients on hand to re-rig. A spare rod also is not a bad idea, because they do break. Your kids will be miserable if you force them to wear bulky, uncomfortable lifejackets. 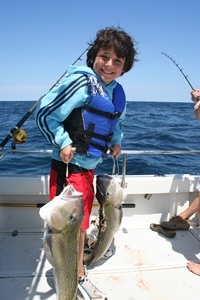 While young David Rudow is happy about his double tilefish hookup here, also note the easy-to-wear lifejacket his dad has fitted him with. Photo by Lenny Rudow. A sure-fire way to ruin any fishing trip is to bring your kids along and neglect to keep them comfortable, occupied, and safe. Here are some basics that go a long way toward a peaceful angling day on the water with your younger family members. Keep plenty of snacks—healthy and otherwise—aboard. The only thing worse than a grumpy kid is a grumpy kid who’s also hungry. Well, a thirsty and hungry kid is pretty bad, too, so bring lots of water and other drinks along. That goes for you, too. Buy your kids comfortable personal flotation devices. Your kids will make your life miserable if you force them to wear a big, bulky international orange PFD all day long. Consider instead more comfortable options, including inflatable PFDs, and vest-type lifejackets that are easier to wear. Yes, there will be boring days when the bite is slow, and if you’re unprepared for them, your kids will make you pay. When things slow down, consider putting one of the kids at the helm, and teach them how to drive as you move from an unproductive fishing spot in search of a better one. Whatever you do, be prepared with alternative onboard activities for them. I always like giving improvised lessons on wildlife we see, such as birds, turtles, and other critters. Speaking of bad days fishing and good days at the office, I’m not sure about how you feel after reading this, but just writing it has given me an itching to get out on the water. Heck, maybe I’ll pile a couple of my nephews in the boat and head out for an afternoon of white perch fishing. Pile up with the right gear, and you’ll be well on your way to creating family fishing memories of your own. Tight lines!